JASPER, ALBERTA, Canada – Located in the heart of Jasper National Park just 45 minutes south of downtown Jasper, Sunwapta Falls Resort offers a spectacular natural setting in which to spend your Canadian Rockies vacation. 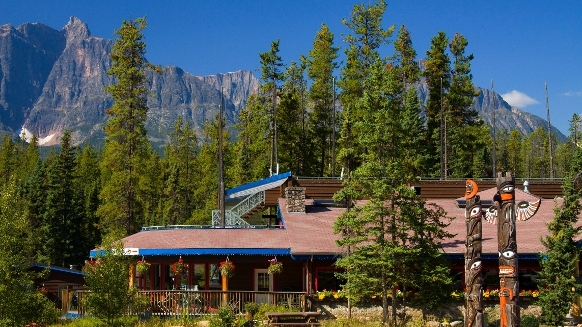 For over 30 years this AAA and Alberta Hotel and Lodging Association-approved mountain hotel has offer cabin-style accommodations in Jasper National Park, home to some of the most stunning scenery in Alberta, Canada. Open May to October, Sunwapta Falls Resort offers guests an impressive range of outdoor activities designed to maximize your Canadian Rockies vacation experience. Horseback riding, river rafting, fishing, bird watching and hiking tours are among the many things to do in Jasper National Park that can be arranged through the hotel.